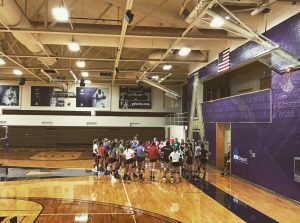 The EC volleyball team attended the Albion College Team Camp in July. They enjoyed competing in 10+ games in their two days at camp, getting to know the Albion volleyball team, and spending time bonding while staying in the dorms overnight. The Mountaineers are very excited for their season this year and look forward to being out on the court once again as a team. Go Mountaineers!